it has become clear to me that i cannot tell a story without making some sort of 90's pop culture reference... so i'm just going to lean into it. i was watching an old video from college of my friends & me hanging out, being weirdos, talking about nothing, really. but every.single.thing. that came out of my mouth was some sort of obscure reference to a movie, tv show, or song. once i noticed this... i was concerned, lol. who & what even am i?? just a millennial idiot box brain blob composed largely of 90's american pop culture tidbits? it's partially true. a real product of my generation i am. can't be tamed. it is kinda funny (& special!) that peter and i get along so well because his well-rounded youth was spent not watching television and he doesn't understand any of my weirdass references. so i don't drop them around him anymore. but i mean, this does make me feel better knowing i'm actually not solely chocked full of nonsense and do have some other things to say, haha. there's just something fun & cool when you throw out a random line from a movie or song in a certain situation and someone else laughs and gets it. this is really a significant factor in many of my friendships actually, lolz. nostalgia is my THANG (in fact - as i write this, my friend & i are texting about the new mary poppins that comes out this xmas. hiii allison.)! so back to bangarang brownies - these brownies are bangarang. hello!!!! and bonus points because i live with someone named peter and i get to say "bangarang, peter" a lot. also. "oh there you are, peterrrrrr." wow, this youtube rabbit hole i'm in is becoming the exact tangent i had on 'the little rascals' 25th anniversary from this old post about grape juice. because this hook 25th anniversary video is equally amazing. and bless you movie people for making 25 year reunion compilations of my ultimate faves. apparently food things & childhood nostalgia go very much hand-in-hand for me. ^would like to frame this. you should have seen my face when i tasted it. eyeballs exploding out of my head. the flavor is incredible. i would even stop right here and freeze this batter in mini cupcake tins to have little bite-sized frozen treatzies... but i dunno much about raw egg consumption, so do what you will. the kahlua + espresso really do the damn thing for me. YUM. ^ left one section mallow-free just for variety. 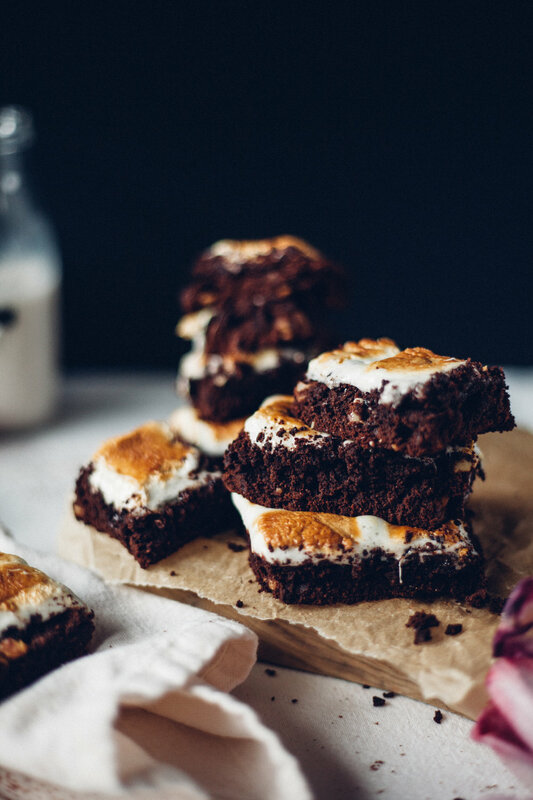 i would highly recommend serving these while they're warm so the marshmallow is still gooey! all the textures are stellarrrrrrrr. yer gunna love it. Brown the butter in a pan (follow these instructions in my other brownie recipe), let cool in a bowl in the fridge for 5 minutes. Preheat oven to 350 degrees F and line a 9x13 or 8x8 pan with parchment paper and spray lightly with cooking spray. While the browned butter is still warm, add to a large bowl or stand mixer with the brown sugar, mixing until glossy. Add the eggs one at a time and mix. Add the vanilla, flour and walnuts separately, mixing in between additions. Finally add the espresso powder and kahlua and mix to combine. When the brownies are not yet baked all the way through, remove from oven and top with large marshmallows. Raise oven heat to 450 degrees F and broil the marshmallows until golden, about 5 - 7 minutes. Do not over-bake the brownies. chocolate dipped peanut butter s'more ice cream bites. and here are a bunch of photos that essentially all look the same. but. O M G.
peanut butter s'more ice cream! rolled into tiny scoops and dipped in dark chocolate! with crumbled graham cracker atop! wowowowowowwowowwww. these came about as i was experimenting with about 6 different ice cream/frozen yogurt recipes for a project. there were a lotta little scientific containers of cream and milk and sugar of different varieties lurking in our freezer. i threw some peanut butter into one of the versions, and it became WAY more of a frozen dough-like consistency than an ice cream. but it IS ice cream! but i was like, whoa. wassuppppp. this stuff is richhhhh. i was about to scoop up an average portion that one would eat in a casual ice cream eating sesh, and i was like, 'oh no.. no no. i can't serve this to anyone in this amount. they may pass out...' so yeah this in MEGA INDULGENT. so then i was like hey i still really want to eat this...but how? and peter kept eating spoonfuls of it in secret. bite-size it is! and obviously dip them in chocolate just to make it a cute little unit. top with graham cracker crumbles and freeze! the actual ice cream is like ultra creamyyyy and thick (almost cookie dough-like) peanut butter ice cream. with a hefty swirl of melted marshmallow and chunks of chocolate. that alone is like WAAAAA YURM YURM brain explosion can't handleeee this life. dipped in a coat of dark chocolate. & graham crumbles. i said that. but i'm saying it again. and it's cold. frozen! in a cute little 2-bite size! oh, and you don't need an ice cream maker and don't need to churn! mostly because it's sooo damn thick that it does not churn. ha! all of the accidents that happened along the way during the development of this particular ice cream base turned out to create a true miracle. looking back into ye olde archives of this blog, it appears that i'm annually turning reg'lar old s'mores into something else. 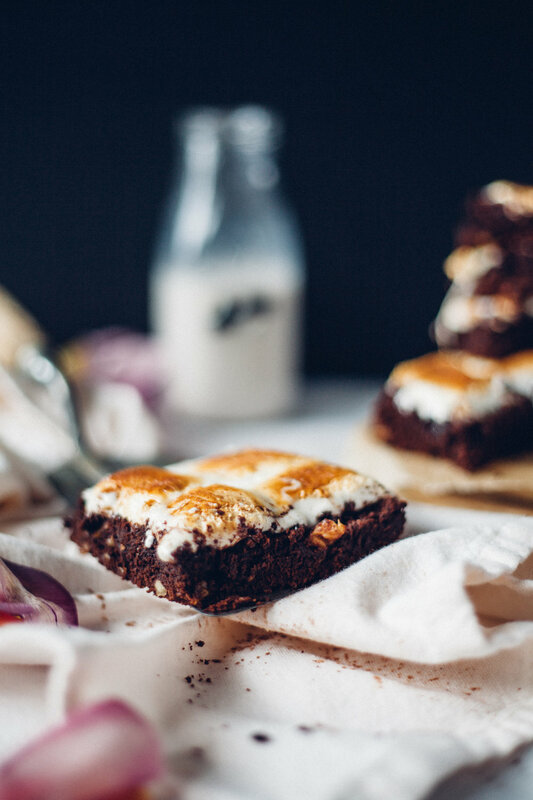 see: baked s'mores donuts & s'mores skillet. this summer's s'mores creation is a very welcome addition to the collection. luv you, little bitez of happiness. In a medium bowl, whisk the egg yolks with half the amount of sugar (1/8 cup) and set aside. On the stovetop on medium heat, add the cream, half & half, other half amount of sugar (1/8 cup), and salt. Whisk frequently until gently simmering and the sugar is dissolved. Lower heat to medium-low. Slowly pour about 1/2 cup of the cream mixture into the bowl of yolks, whisking constantly so the eggs do not scramble. Add the yolk + cream mixture back to the pot and raise heat to medium. Stir constantly with a wooden spoon until the mixture thickens into a custard-like texture, about 3-5 minutes. Remove from heat and let cool about 5-10 minutes. Add the vanilla extract and xantham gum and whisk until smooth. Xantham gum is optional, but a small amount of it helps to thicken and bind the ice cream for a smoother texture. Once the ice cream base has cooled off, pour it into a large airtight freezer bag and freeze for about 3-4 hours. Pour the nearly frozen ice cream base into a bowl and stir in 1/2 cup of creamy peanut butter until completely incorporated. Melt some marshmallows on low with 1 TB coconut oil (or butter) and swirl those into the ice cream. Add the chopped chocolate and fold. Using a melon baller or a spoon, roll the ice cream base into balls (smaller than a golfball). I sprayed a little cooking spray on my hands and worked very quickly to keep it from melting. Place all the ice cream balls onto a plate or tray lined with wax paper, insert toothpicks into the center of each, and freeze for about 20 minutes. While the ice cream balls are chilling again, melt the dipping chocolate over a double boiler, stirring frequently. I used melting wafers that are specific to candy dipping, but you could use chocolate chips or a chocolate bar you have on hand. Remove from heat once melted. Crumble up some graham crackers in a ziplock bag using a rolling pin or bottom of a mug. Carefully dip the chilled ice cream balls into the (cooled) melted chocolate. Use a spoon to cover the top with chocolate. Set on a plate or tray lined with wax paper, and immediately sprinkle graham cracker crumbles on top. Repeat until all the bites are chocolate dipped and sprinkled with graham. Freeze for about 20 more minutes. Remove the toothpicks before serving, and ENJOY! Store in a parchment-lined airtight container in the freezer.